2, Once I have replanted what I need I know exactly how much I have left to sell so I don't have to worry about accidently selling the lot or having too much stored. 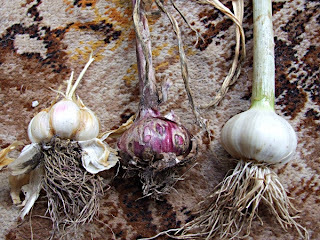 At this time of year we won't be getting any more rain so the cloves won't rot in the ground while they are dormant and I don't have to have the beds completely bare until the cloves start growing in Autumn as I can plant a quick growing crop over them like amaranth or mizuna while there is still some moisture in the soil, and when we do get rain I can also plant that quick crop while the garlic is shooting. The beds end up being bare for only 3 months over summer when I can't get anything to germinate anyway instead of 6 months while I wait for the garlic to shoot in Autumn. This system has worked for me for the last three years. 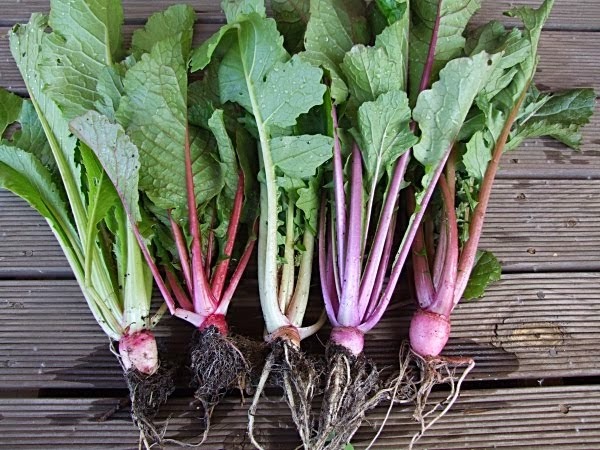 These are the varieties I dug and planted today from the left - un-named with light pink blush to the skin, Monaro Purple, Large white hardneck. The Monaro purple I dug a few weeks ago but wanted to wait till I decided where I was going to replant it. I had such a bad year for garlic this year that I have made some better beds for them all in J block. Large white hardneck is a large, pure white skinned bulb which seems to be fairly hardy and with a fairly hot flavour. With a better season the bulbs do get bigger than this. I love Monaro Purple mostly because of the lovely red/purple colour of the clove skins. It (usually) has huge bulbs but this year was disappointing. The flavour is warm and spicy. Although it is a hardneck it has a reputation of storing well. 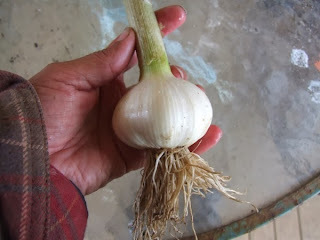 I am still waiting for the Elephant garlic and a un-named supermarket variety to be ready in a week or two. In other news, I have to take a drive to Portland tomorrow for a visit to the dentist. I have been having a bit of trouble with one molar so I have decided to 'man up' and have it seen to. There goes the new tyres for the van for another month *sigh*, oh well, it has to be done as a sore tooth doesn't fix itself when you ignore it. - Will you be home tomorrow morning Craig? It's the first I leave a comment on your blog. Actually, this isn't the right post because I hate garlic! I was the first follower joining this site. Wow Giuseppe, thanks. It is great to know who is following. 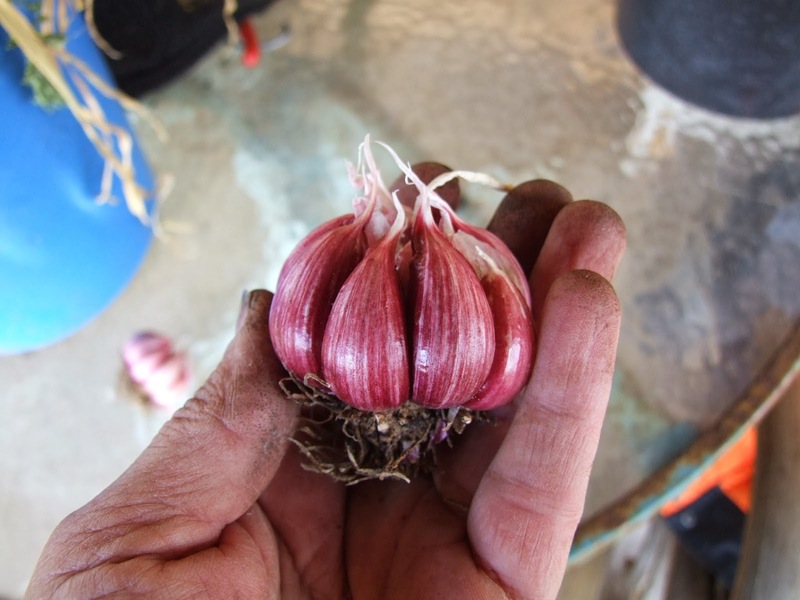 I don't eat garlic much either but it sells well at the markets.